Here’s my front yard from my front door. Hi guys, Want some pictures to look at on a Saturday night from the most beautiful place in the world, Lord Howe Island. Sure you do. This place is just so picturesque you just can't take a boring picture. Don't even aim your phone or camera and you will get an interesting pic. Put some thought into it and you'll have a wonderful picture. But for us palm lovers, you want to see palms. So let's start with Howea. And on "ground level" in the upper area. I had the opportunity and great privilege to visit Rafael and both of his palm gardens yesterday. They are both located in Ovar, a suburb south of Porto in Portugal. After seeing many of Rafael's photos here on PalmTalk over the years it was great fun to finally visit and see for myself all the hard work and dedication that he has put into his two gardens. The first ten photos are from the more recent garden, which is the one which had a major issue with a retaining wall a few years back (there is an old thread here on PalmTalk), and this is also the larger garden and the one where Rafael is putting in most of his effort these days. There is an upper part and the first several photos show this area. This area is pretty much all planted out, unless Rafael decides to "Velez" it even more. The lower part of the garden, as can be seen in some of the photos, is just at the beginning stage, and Rafael is hoping (I'm sure! ) to transform this area into a real palm jungle as well. 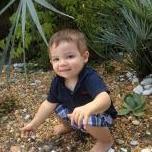 The final seven photos are from Rafael's initial home and garden, and this property is fairly close to the water. As can be seen in the photos, this garden is well established, and I sensed that there may only be very limited additional plantings here. I'm sure Rafael will be happy to provide additional information and he would also clearly be the one to answer any questions. (Yes, he gave me the name of every single palm, but I may not have memorized all of them. OK, maybe there was the occasional Livistona where the species name temporarily had been forgotten... ). And Rafael - you've done a fantastic job with both of these gardens, just in general, but also considering the challenging climate you're dealing with. I was eating some watermelon in the dining room and happened to look out the back window and this caught my eye! Funny bcuz i was outside several times this morning and didn't notice it. First time ever blooming. Hopefully it sets seeds bcuz they will probably be pure as all my other Cocco's are way past blooming and in the fruit stage. How bout a couple more! All of these first 3 pics are from the base of Mt Lidgebird. Here is the late, great Richard Douglas. Thanks to a tip from PalmTalker donalt, I went downtown Orlando to investigate a couple of possible Beccariophoenix alfredii street plants. Sure enough they turned out to be BA. The first and second photos are of 7 planted in a median that separates bus and car lanes. It is on Livingston St. just east of I-4 in between the LYNX bus station and ACE Cafe. Interestingly the ACE Cafe is located in the historic Leu Building; Mr. Leu of Leu Gardens fame, this is where his business and warehouses were located. Mauritia flexuosa growing in Brevard County! Unbelievable Mauritia flexuosa growing in Micco at Jason and Sues beautiful Garden. Jason first photo, my husband Greg in third photo. This palm survived the 2010 freeze! I started trimming leafbases(many just fell off) up on my sabal causiarum. Less than 2' clear, its a fattie at 36" diameter. 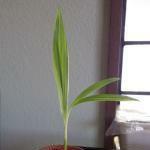 This palm was planted in summer 2011 as a big strap leaf seedling. It has come a long way to about 20-22' in overall height. Its a beast and has brought 2 volunteers under a nearby bush(not sure if I cut down the bush now. 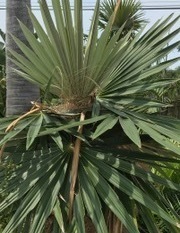 Originally it was labelled a sabal domingensis by Tejas tropicals but the small fruits and 3 orders of branching match Scott Zonas ID of causiarum. And yes it has ligules, but not until it trunked a couple years ago. For scale, my foot is wearing a 12 1/2 size shoe 13" in length. Here’s my biggest hybrid Archie abloom and aflame in the setting sun on a fine northern hemisphere evening. Show is your palms aflame in first or last light! I've read threads on here about spreading the love (read obsession) of palms with friends and neighbors. Today, a success story from my neighborhood: after seeing palms slowly take over my front yard, my neighbor across the street asked about planting one in her front yard. I was super happy to plant this parajubaea for her. Here she is, happy palm, happy palm owner. Another belmoreana pic and forsteriana with Mt Lidgbird and Mt Gower in the background. And the large open lower area - lots of exciting possibilities here, that's for sure!